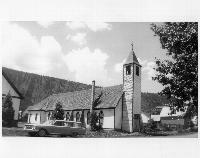 The Crested Butte Mountain Heritage Museum with Paul and Joy Adams invite you to a Soirée at St. Patrick's Join us at the historic St. Patrick Catholic Church for a fundraiser to help "Preserve and Share the Uniquely Diverse History of the Gunnison Valley". Heavy hors d'oeuvres will be provided by Jason Vernon and paired with a selection of wine and beer. Local historians Duane Vandenbusche, Trudy Yaklich, and Kay Flint will edify you on the history of the building and surrounding events. Tickets are $125 for Non-Museum Members and $100 for Museum Members and can be purchased by calling the museum at 970-349-1880 or visiting www.crestedbuttemuseum.com TICKETS ARE LIMITED!